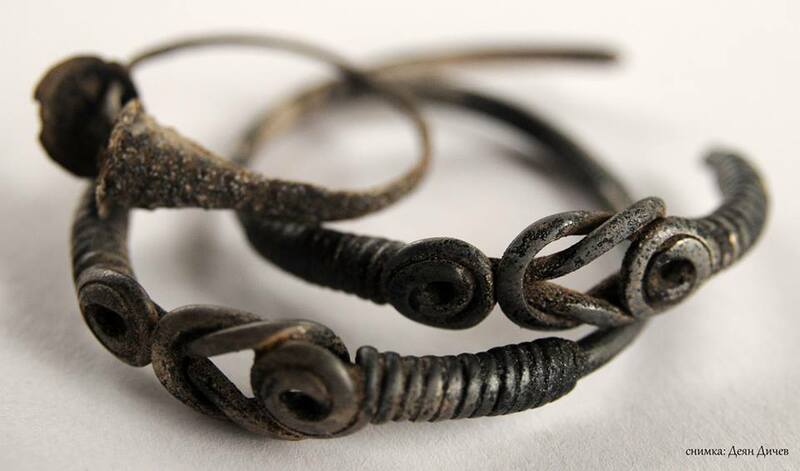 A silver treasure of consisting of bracelets, earrings, and coins has been discovered by the archaeologists excavating the fortified residence of an Ancient Thracian ruler from the Asti tribe located near the town of Brodilovo, Tsarevo Municipality, Burgas District, in Southeast Bulgaria. The excavations near Brodilovo, in the area known as Pastich, have been led by archaeologist Deyan Dichev, and consulted by archaeologist Daniela Agre from the National Institute and Museum of Archaeology of the Bulgarian Academy of Sciences. The silver treasure in question has been found amidst the ruins of the residence of the Ancient Thracian ruler discovered previously. It consists of several silver bracelets and earrings as well as ancient silver and bronze coins, Tsarevo Municipality has announced. The silver coins are tetradrachms from several Ancient Greek polises on the coasts of the Mediterranean and the Black Sea: Maroneia, Odessos (today’s Bulgarian Black Sea city of Varna), and Thasos (located on the Island of Thasos). The silver Ancient Thracian treasure has been found at the end of the 2015 excavations of the fortified residence which most probably belonged to a local paradynast, i.e. a co-ruler or a regional ruler who was in charge of governing the northern parts of the Strandzha Mountain at the end of the 2nd and the beginning of the 1st century BC. It is reminded that the fortified home of the Thracian ruler near Bulgaria’s Brodilovo was destroyed in a fire that has helped preserve a lot of belongings and household artifacts. The collapsed walls and roofs have essentially conserved the contents of the Ancient Thracian residence for some 2,200 years. During their excavations of the site so far the archaeologists have found over 100 well preserved ceramic vessels, tools, and armaments. The residence which has been discovered near Brodilovo has an area of 1.5 decares (app. 0.4 acres), and was surrounded by a fortress wall which is 2.4 meters wide, and has been preserved up to a height of 1-1.5 meters. The archaeologists have also unearthed part of a fortress tower watching over it. The residence existed from the end of the 2nd century BC until the beginning of the 1st century BC when it was burned down. In one of the rooms in the residence, the archaeologists have found a sacrificial altar. Around it, they have discovered a large number of ceramic vessels, including both locally made Thracian vessels and imported Ancient Greek pottery such as canthari, amphorae, and cups from the Ancient Greek polis Megara featuring floral motifs and depictions of humans. Some of the discovered ceramic vessels have been found still containing grain such as wheat and millet. Other finds include metal billets which may have been set aside for the production of tools and weapons, and two Ancient Thracian swords – one from the type known as makhaira, and another from the type known as rhomphaia, which was typically used by the Thracians in the 3rd-1st century BC. The excavations of the Thracian paradynast’s residence near Brodilovo as well as the exploration in the last few years of a similar site near the town of Sinemorets on the Black Sea coast are shedding light on one of the least known pages in the history of Ancient Thrace, the period of the 2nd-1st century BC, says the release of Tsarevo Municipality based on the conclusions of the archaeologists. The said period saw the emergence of one of the most powerful and important Ancient Thracian Kingdoms, that of the Asti tribe, which inhabited the southeastern parts of today’s Bulgaria and the Balkan Peninsula. The Kingdom of the Asti developed against the backdrop of the major conflict between Ancient Rome, i.e. the Roman Republic, and the Kingdom of Pontus in Asia Minor. Based on their discoveries of the artifacts and treasures near Brodilovo and Sinemorets, the Bulgarian archaeologists have concluded that the region of the Strandzha Mountain played a major role in the political and economic space of the Kingdom of the Thracian tribe Asti. The archaeologists have hypothesized that the newly found Thracian ruler’s residence near Bulgaria’s Brodilovo might have been destroyed during the wars of the Roman Republic against King Mithridates VI of Pontus (r. 120 – 63 BC), ruler of the Kingdom of Pontus in Anatolia. At that time, the southeastern parts of the Balkan Peninsula were inhabited by the powerful Ancient Thracian tribe Asti, who are mentioned by Ancient Roman historian Livy (64 or 59 BC – 17 AD). The Asti were at one point part of the Odrysian Kingdom, the most powerful Ancient Thracian state ever. Both the newly found Ancient Thracian residence near Brodilovo and the one found earlier near Sinemorets are believed to have belonged to rulers of the Asti. Both are believed to have been destroyed in the same military campaign during the Mithridatic Wars. The archaeological excavations near Brodilovo have been funded by Bulgaria’s Ministry of Culture, Tsarevo Municipality, and the international foundation Horizons; all finds, including the newly found silver treasure, will become part of the collection of the Tsarevo Museum of History. The Odrysian Kingdom was a union of Thracian tribes dominated by the tribe of the Odrysians (also known as Odrysea or Odrusai bearing the name of a mythical ruler, Odryses or Odrisis, (ca. 715 – ca. 650 AD), was the most powerful state of the Ancient Thracians. It existed from the unification of many Thracian tribes by a single ruler, King Teres, in the 5th century BC till its conquest by the Romans in 46 AD on the territory of most of modern-day Bulgaria, Northern Greece, Southeast Romania, and Northwest Turkey.